Can watercolour paper deteriorate over time? I’m asking because I don’t know the answer to this question. I received some old Arches paper, stacks of it really, both 140 and 300 lb, cold press and rough finishes. I’ve been using it occasionally, but have never really been satisfied with the results. In fact, it made me think I didn’t like Arches paper at all, which is in fact not true. I’m not sure where the paper was stored, but I am pretty certain it was kept dry. When I take a brush to it, the texture is just not right, and the paper seems flat and seems to have lost its sharp edge, if that makes any sense. This first sketch is one I painted on new Arches paper. When I run a dryish brush along the paper I get what I am looking for, which is a textured line. I am also happy with the way the paint granulates in the hills and valleys of the paper. The second sketch is a detail of the same setup, painted on the old stock of Arches paper. The granulation is much less apparent and I can’t get those nice edge effects. I am curious to hear if you have had a similar experience with old paper. If this paper is no good, I am wondering why I’m letting it take up shelf space in my studio. Maybe, or deterioration of sizing perhaps? I think, that being a natural product, the external sizing has deteriorated over time. Storage conditions might have had something to do with it or it might just be a natural decay to do with ageing. I’ve painted with a group for 14 years, and occasionally one or more of us has used some older Arches and had the same sort of problems. I have some that’s about 8 years old, kept in flat files the entire time, and some of the sheets have areas that blotch with the paint or hold the paint differently. I also read, some years ago, about others who had purchased a “bad batch” of Arches, so I think this isn’t an isolated problem. It seems that it might be a problem with the sizing. I am going to test out a solution that someone emailed me, and if it works, I will post my experiment. And best of all, it’s a cheap and easy solution. Hmmm, interesting – how old is old? Makes me think I should get cracking and use up the paper I have in case it does deteriorate! I haven’t had the experience you’re talking about, but it does sound like what happens when I’ve painted on the “wrong” side of Arches paper. Love your blog, always look forward to reading it and often recommend it to others! I think this must be about 15 or 20 years old. I’m sure if you bought paper in the last few years, it is still fine. So glad you like the blog, and sure, pass along the link to others! I have some 20-year old Arches paper and it performs well. I do get the entire page wet before I begin. Perhaps this changes it somehow? And yes, sizing over time might change. From a paper conservator’s point of view, yes, paper deteriorates (I am an object conservator, but know a bit about paper as i also make it.) EVERYTHING does. But we are talking yellowing, loss of flexibility (brittle), foxing (little brown-rust-spots) and so forth. If there is none of that evident, the paper should be fine. And now I know what that is too! Dots. I think it’s something wrong with the process. Foxing is indicative of a non-reversible deterioration process, most often found on cotton paper and quilts and babies clothes. People come to us to ask how the little rust spots got on their christening dress… is is a bacteria, if I remember. It isn’t something I have to deal with too often in the restoration biz. Hi Katie, I think the problem is with the sizing which would affect what I do but not you. If you soak the entire page and stretch the paper, the sizing will come off. From what someone else just told me (by email) what I am dealing with is a deterioration of sizing. This same person also sent me a solution which I am going to try out soon enough, and I will certainly post the results. It sounds like you have an interesting job. Thanks for writing! I think it is sizing too — and would love to hear how it goes! Anne, I may have a solution for both of us. I will try out the idea that someone sent me and let you know if it works. It’s cheap and fast and if it works, it will solve my paper problem. Sheryl, I think someone may have sent me a good solution which I will be trying out. If it works, I will post it so everyone can read about it. My only disappointment w/ old Arches paper I received from a friend when her husband passed..is that it has yellowed so much..I should check the grain again..I am attached to it for obvious reasons:)So thoughtful..and this was at least 20 yrs ago..
Sound to me like it might be worth trying since it is such great paper. And let me know what happens. Thank you! I agree ..and will try on a few pieces..
Can’t help re the paper problem … but I’m guessing the reason you’re keeping it on the shelf is because like most of us you figure you’ll find the perfect use for it one day regardless of the fact that you haven’t done so yet! So, so true Tony. I can’t bear to part with it. But a friend just emailed me a solution that I will be trying in the coming days. I’ll write a post about it if it works. And then I’ll paint on the old paper! That’s a good point about the bleach Helen. I will write another comment to Monique to warn her. As for the fuzzy paper, I find that Fabriano is more like that, especially the soft press paper which I used to use quite often, but like you I prefer the sharper Arches paper now. I don’t have a contact at Arches. Do you? Shari, I don’t have a direct contact at Arches, but someone like Joe (at Cheap Joe’s) would likely be happy to get you in touch with the right person, either in their own company or over at Arches. p.s. 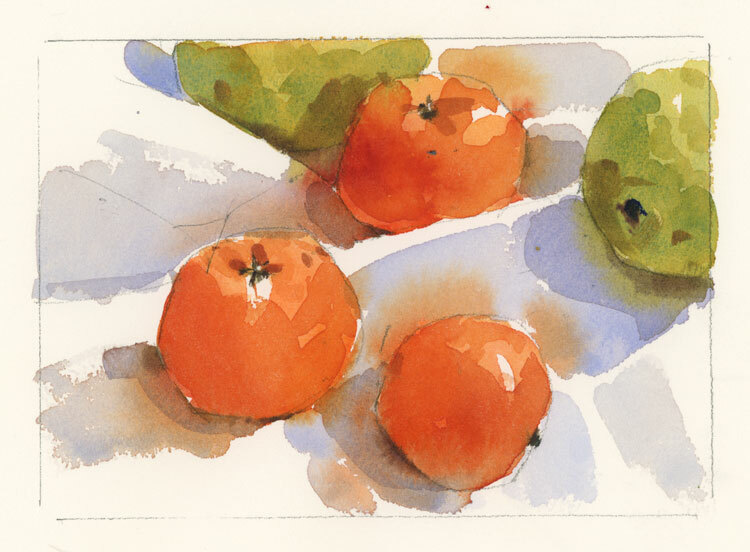 the same concern exists for me about the use of salt in a watercolor. Having lived in Montreal where salt eats the bottoms of cars over the winter months, I am fearful of what it will do to paper over time. Even when you rub it off, there’s a remaining residue. Be well, Shari! I enjoy your blog! I have had the same concerns over the years and I enjoyed the comments, but I like both sketches anyway…. Thanks Ross. It’s interesting to hear about people having these same problems and concerns. The consensus seems to be sizing, so I hope there was some helpful info in there for you too. Canadian illustrator Elizabeth Mrazik-Cleaver would use water colour and paper and tear it up to make her wonderful collage illustrations. Omi, yes, I didn’t even think to say this, but do NOT store your paper in unfinished wooden drawers (or any garment fo rthat matter — and that includes cedar chests.) Many woods leach for centuries, and will discolor paper and also push their chemicals (depending upon the wood) into the paper. A coat of shellac or acrylic paint should do the trick, then lay in a acid free piece of cardboard. Talas has such things. I too have a supply of old Arches waiting to be used. I will be waiting to hear about your easy solution in solving the problem. My guess is that it is the gelatin solution that is used for the external sizing. I’ve experienced issues with old watercolor paper from two makers. I’m not sure of the brands as they pieces are cut from a larger sheet. 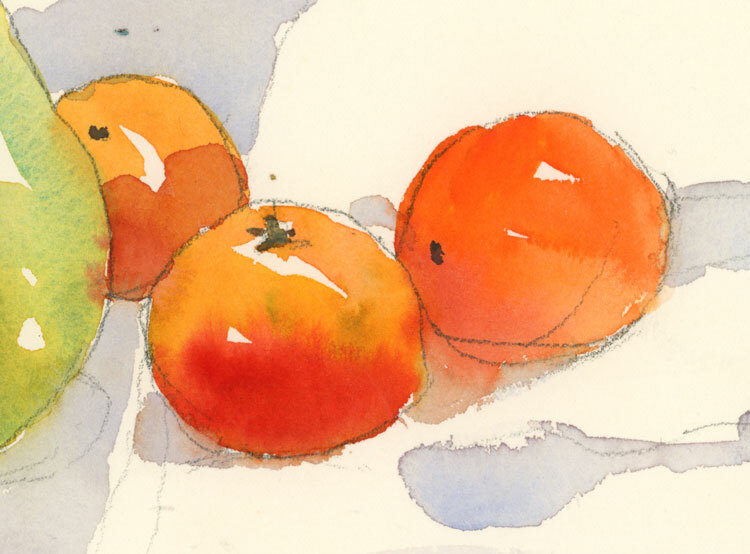 The surface becomes fuzzy; masking fluid removal will sometimes take the paper with it; and overall, pigments are dull. It leaves me wondering if there’s been a change in the materials used to make the paper because I notice some products no longer perform as well or the same as they use to. One soap I learned, changed the formula ingredients, same name, not the same soap. I’ve also noticed a change in tube paint, watercolor and acrylic not performing the way they use to. Do artists change with age? Sure, but paper and paint shouldn’t. I didn’t think until reading your question to test old paper I’ve had since the early 1980s. I’ll give them a testing, and post tomorrow afternoon. Remember Arches paper is now produced by Can on. So the “old” paper was produced differently than now. That might be why you get a different feel from the paper. I remember when it changed some people had trouble getting used to the “new” paper. Perhaps, you could use it for test sample of colors or some ramdom things but no sketches? I currently use French Ultamarine and Phthalo Blue. But, I am not sure…. Ultramarine is often a bit strong for me (even if I like bright colors)… But it’s useful, diluted, for the skies, and to mix purples or greys… The Phthalo blue (green shade, I think) is great for blue-green water, sky at the horizon, blue bright shirts or fences 😉 … Mixed with Quin Fuchsia, it makes a fairly dark blue grey (btw, I also bought some Indigo, for conveniency). Sorry for being a bit chatty… 😉 Do you think some Cerulean Blue would be a nice addition or replacement for my palette? What would be the difference with the colors I already have? Is it a matter of hue, opacity, value ? ?… And, compared with a Cobalt Blue? And thank you again for the daily inspiration, of course. In the past, when I’ve had questions or issues with Canson or Arches papers, I have emailed Amanda.HUERTA@hamelinbrands.com. She has always responded quickly and been super nice. I was never happy of the Arches paper. I liked my great-grand mother stach better! It was old an yellow but reacted better. I wonder if Arches has changed its technogy in the past few years and I wouldn’t be surprised if they did. I use Fabriano paper now, the granulating is just perfect for me. I’m a pitiful watercolorist and I need all the help my paper can provide. You make me want to try Arches again though! Hi Delphine. I think Arches did change its formula recently. At least that is what someone told me. I love Fabriano too, especially the soft press paper. But it’s nice to have some variety. I agree, variety is nice. I remember Arches from my students days, and it’s not a good memory. I tried recently the new Watercolor Paper from Winsor and Newton and I’m hooked. I’m finally making some progress! By the way,I wanted to thank you for the inspiration. Reading you does help! I notice this is an older thread, but……it came up when I googled “old Arches watercolor paper”. Did you ever attempt the solution you mentioned and, did it work? When I try to put a clear wash on the paper it seems to absorb quickly off the surface, so I’m guessing the sizing has deteriorated. Anxious to get your feedback. Hi Mike. It did not work well at all. Once that sizing has deteriorated, the paper is finished, as far as I’m concerned. I’ve been using new paper ever since. I don’t want to spend time on a drawing that will only end up in the trash when the paper turns out to be too old to paint on. I guess you agree.